How to buy a write-off | What Car? 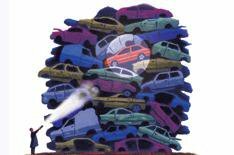 It's time to scour the classifieds for a new bargain following your cars clanky demise. A bargain jumps out at you, but theres one problem: the ad says its a rebuilt write-off. A write-off is a car that is either too badly damaged to be repaired, or that the insurer has deemed uneconomical to put back on the road. However, there are five categories of write-off (see panel) and Category C, D and F cars could be real bargains if theyve been fixed properly, and if you buy carefully. An estimated 500,000 vehicles are written off in the UK every year and, according to Nicola Johnson from vehicle history check specialist HPI, theyre commonplace. One in 25 vehicles checked by HPI is recorded as an insurance write-off, and we currently hold 650,000 write-offs on our database, she says. Scrap only the car should be crushed and should never return to the road. It is too damaged to have any salvageable parts. The bodyshell of the car should be crushed because it isnt fit for road use. However, some parts can be reclaimed as spares or used as scrap. This vehicle has been extensively damaged, and the insurer has decided not to pay for a repair. a Category C write-off, but the insurer has decided not to fix it. This vehicle has been damaged by fire and the insurer has decided not to repair it.Just over 75% of all crashes occur below 20mph, but even these accidents can be expensive to fix. Motor industry research organisation Thatcham has been running crash tests on car bumpers for the past few years, and has found that even ordinary cars, such as the Honda Jazz, are potentially susceptible to being written off after a slow shunt. The repair cost for the Jazz after a shunt front and rear at 6mph was 6112, which is 53% of the original list price. Thats a high price to pay for a low-speed shunt, says crash research manager Matthew Avery. Thats exactly why cars such as these can be classed as category C or D write-offs. An insurance company may be pessimistic with the cost of repairs, or use a larger, more expensive, nationwide repair organisation, thereby bumping up the cost of the fix. However, if someone buys the car and fixes it using cheaper parts and businesses with lower labour rates, it can be fixed and become a second-hand bargain. Unfortunately, write-offs represent a golden opportunity for criminals, because they can be poorly repaired then disguised as genuine cars with a clean history. These cloned vehicles are then sold on to unsuspecting buyers. Theres also the risk that other faults may surface at a later date that are directly connected with the original accident. Youll have little chance of claiming against whoever repaired the car, unless you can prove they were negligent.